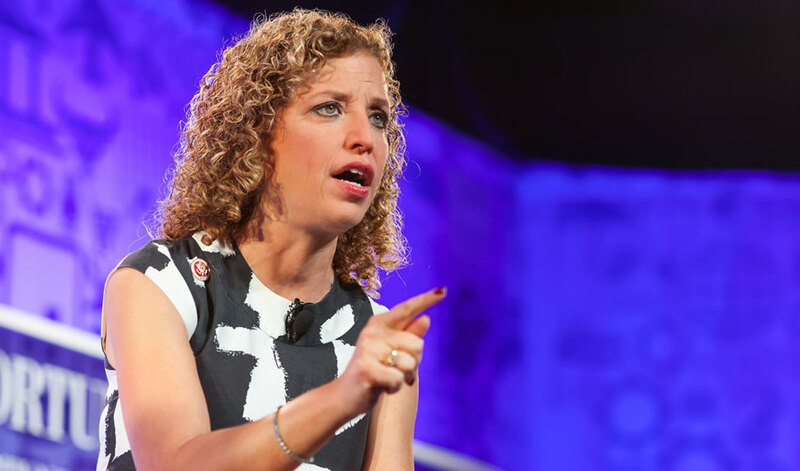 In this Oct. 16, 2013 file photo, DNC chairman Debbie Wasserman Schultz speaks at the Fortune Most Powerful Women Conference. Newly-leaked emails show that a major figure in Democratic nominee Hillary Clinton’s presidential campaign urged the Democratic National Committee (DNC) to schedule meetings with other prospective presidential candidates to make the process appear less biased. The email, sent January 2015 before the official launch of Clinton’s campaign, is part of the latest dump of John Podesta emails by the online hacktivist group WikiLeaks. The message, authored by campaign manager Robby Mook, is about a planned meeting between Clinton and then-DNC Chair Debbie Wasserman Schultz, and also describes a meeting between Mook and White House political adviser David Simas. Mook’s message mostly deals with mundane political details, but at the end he makes an interesting comment that suggests an awareness of pro-Clinton bias at the DNC. The sentence is brief but carries a clear implication: Mook is urging the DNC to set up meetings for the sole purpose of looking like it isn’t in the tank for Clinton’s campaign. The emails supplement an ample amount of existing evidence that the DNC overtly favored Clinton during the presidential primary process, despite the fact it is supposed to be politically neutral between different Democratic candidates. For instance, then-deputy DNC Chair Donna Brazile fed primary debate questions to Clinton’s campaign, while leaked DNC emails from the summer showed a great deal of official hostility towards Sen. Bernie Sanders’ campaign. Mook’s comment indicates the Clinton campaign was very aware of the DNC’s bias from the beginning of 2015, and was directly advising Wasserman Schultz on how she could make this bias less obvious. Funny thing is, we knew all this and more was going on. Now there’s proof. Not that Hillary supporters care. In fact, these dullards support and praise her underhanded, immoral tactics. Were she to be elected, expect hundredfold corruption of this sort.